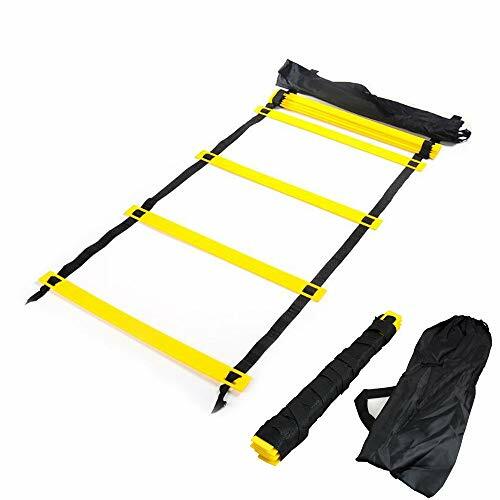 ⚽Agility Ladder is made of heavy duty plastic rungs and durable nylon straps, suitable for any high-intensity training. ⚽Designed for improving foot speed, movement control, helping improve coordination, strength and physical dexterity, can be used to train lateral response, coordination, overall balance and general fitness. ⚽Perfect for athletic training, football, soccer, basketball drills, hockey, lacrosse, tennis, badminton, rugby to increase acceleration, leg strength, and speed, core skills, balance, rhythm, and body control. ⚽Easy to Install & Carry: Simply unravel the straps and rungs to set up on your chosen surface. Freely adjustable training lengths for different exercisers, the beginners or professional athletes. Also it can be easily carried in your bag to train anytime and anywhere. ⚽High Quality Material: Made of high-quality Polypropylene material designed to last for years of use and training; the heavy-duty plastic rungs won't move easily, prevents ankle rollover, decreases the chance of Injury and the individual rungs can be moved and changed for special needs. ⚽Service Guarantee: Your satisfaction is our priority. Please contact us first when you have any problem, we will give you the best service and solve the problem ASAP. Thank you so much.